With the sides in the BDS conflict outlined in terms of numbers and organization, I’d like to turn the conversation over to the tactics used by those seeking Boycott, Divestment and Sanction against Israel. (1) Find an organization or individual that is self-identified with progressive or human-rights causes, preferably one with a history of taking stands on international matters. Ideally, these targets should have a track record of taking such stances after they hit “critical mass” in the media, rather than as the result of deep knowledge about the subject within the organization. (2) Present the targeted group with the BDS case in stark black-and-white terms in which any information not directly related to Israeli villainy and Palestinian pristine innocence is removed from consideration. (3) Push for the organization to take some kind of boycott or divestment stance, however small. Insist that the institution’s professed progressive and human-rights credentials leave them no choice but to do as the BDSers say. The details change from case to case. Sometimes (as in the case of municipalities and churches), the BDS appeal has been made directly to leaders behind the backs of citizens and church members. In the case of institutions with low thresholds for public petitioning (like food co-ops) attempts are made to get around the leadership to put boycott questions onto a public ballot. But whether the target is a university, church, city, union, co-op or over-the-hill rocker, the steps outlined above are pretty much always the same. 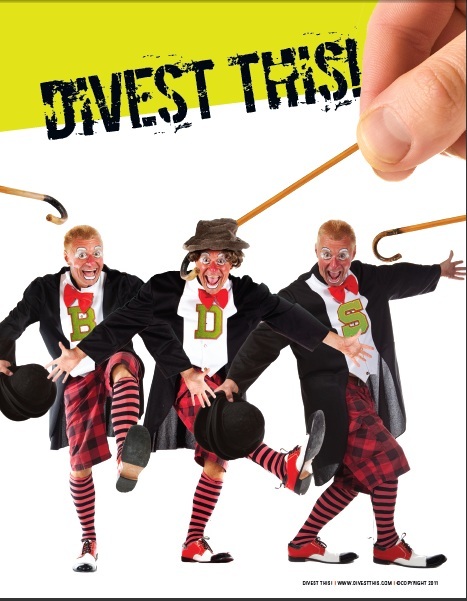 The divestniks know their demographic, which is why you’ll never see them take their roadshow to conservative or even moderate audiences, or even progressive audiences with a track record of careful consideration before taking stances on controversial issues. And steps 4-5 are crucial since, knowing how unpopular anti-Israel stances are among the general public, BDSers must create the appearance of institutional hostility towards the Jewish state from a well-known person or organization in order to try to create a reality that does not exist. Now most political movements are about changing attitudes and dynamics, which is all about changing the “reality” of a particular approach to controversial topics. But this betrays the thin line between political action and political fantasy (a subject I’ve discussed in the past). For if you look at where BDS has been temporarily successful (such as the Presbyterian Church), the divestors have been so fast to move onto the next target that they immediately abandon the very people they’ve recently won over, leaving these groups to discover the consequences of the decision they were bullied into taking which often leads them to reverse course. The widespread use of BDS hoaxes in 2009 is symptomatic of the fact that the five-step tactic noted above, while effective, hits a roadblock when it encounters an institution that knows what it’s dealing with when divestment comes knocking at the door. And after a decade of failed divestment and boycott efforts, the number of college administrations, student governments, church groups, etc. that are completely unfamiliar with BDS tactics and history becomes shorter. Which is why many anti-Israel groups decided last year to skip steps 1-3 entirely and simply publicize “victories” that never happened. That observation aside, tactics involving presenting the complex Middle East as an oversimplified, emotionally driven morality play present a challenge to those of us who fight against BDS who are not inclined to counter their simplified, inaccurate storyline with a simple, untrue storyline of our own. Which is why we often find ourselves on the defensive, providing background and context to counter gut-wrenching images and ardent accusations. I’ll have more to say about offense vs. defense tomorrow, but for now I should note that the BDSers themselves provide an example of how their own tactics can be countered. For if you’ve ever been in a debate with them, watch how quickly they’ll dismiss any accusations of racism, sexism, homophobia, corruption and totalitarian violence against themselves, the Palestinians or Israel’s Arab neighbors by either ignoring it, dismissing it with a scoffing laugh or insincerely accepting such challenges then immediately spinning them into another condemnation of the Jewish state which they insist must continue to be the only topic of discussion. If they feel that they’re allowed to draw the boundaries around what can and cannot be discussed in a conversation about Israel, the Middle East or BDS, then why can’t we?